In honor of the of November's liturgical readings on the Last Things, we are devoting this entire month to looking at one important aspect of eschatology: the question of the population of Hell relative to the assertions by Fr. Barron, drawing on the theology of Hans Urs von Balthasar, that we can "hope" that Hell is empty. We have already examined this teaching in light of the Bible, Vatican I, the Catholic sensus fidelium and from the point of view of the universal Ordinary Magisterium; in each case, Balthasar has nothing to stand on. In this article, we put the coup de grace to the arguments of Fr. Barron by examining his appeal to Benedict XVI's encyclical Spe Salvi. 46. With death, our life-choice becomes definitive—our life stands before the judge. Our choice, which in the course of an entire life takes on a certain shape, can have a variety of forms. There can be people who have totally destroyed their desire for truth and readiness to love, people for whom everything has become a lie, people who have lived for hatred and have suppressed all love within themselves. This is a terrifying thought, but alarming profiles of this type can be seen in certain figures of our own history. In such people all would be beyond remedy and the destruction of good would be irrevocable: this is what we mean by the word Hell. On the other hand there can be people who are utterly pure, completely permeated by God, and thus fully open to their neighbours—people for whom communion with God even now gives direction to their entire being and whose journey towards God only brings to fulfilment what they already are. 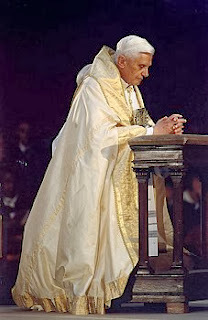 The section in question is Benedict's comments about "the great majority of people" who remain fundamentally open to God and, after the Judgement and the fires of Purgatory, may take their place "at the table of the eternal marriage feast." Fr. Barron apparently equates Benedict's hope for "the great majority of people" with Balthasar's hope of universal salvation. There are several things that can be said. For one thing, Benedict does not agree that we can hope that all will be saved because this hope he expresses is not about all humanity universally but about "the great majority of people"; this may seem like a minor distinction, but it is enough to distinguish Fr. Barron from Benedict, since, returning to introductory logic, even one less than "All" is "Some." Benedict does not express hope that "all" will be saved because he specifically states that he is referring to a "majority" not a totality. He speaks of the state of our soul being the product of "the course of an entire life"
In speaking of the saints, he says they are "fully open to their neighbours" and that they experience union with God "even now", comments that would not make sense if he was speaking of the afterlife. These saints are on a "journey towards God", something that would terminate in the next life when we are no longer viators but comprehensors. He speaks of realities we know "from experience" "in human life". He talks about our deeds of good and evil "In the concrete choices of life." All this makes it clear that the pope's foregoing comments about those who are on the way to Hell, those on the way to Heaven, and those whose end is indeterminate (as far as we are concerned) are all referring to the state of our souls in this life. What he appears to be saying is this: In this life, there are people whose rejection of God is so complete that, from a human point of view, reconciliation with God and the truth seems impossible. These people are on the path to Hell, and history has given us ample examples of such people. Similarly, there are saintly individuals on this earth whose love of God is so intense that "even now" they experience a foretaste of the beatific vision. Such people, from our point of view, are on the path to heaven. Nevertheless, the remains a great majority of people whose final destiny, from our point of view, is indeterminate. They remain fundamentally open to good, but through a series of compromises with evil, their disposition to goodness has been severely weakened. The pope then asks what will become of such people on judgment day, which leads into a conversation about the afterlife. Ultimately, the message is that there are few humans who are irredeemably evil or blamelessly good. Most fall somewhere in the middle. This is all we can draw from the pope's statements. But let us go further, because Ralph Martin notes in his book that this passage is in need of further clarification, and I agree with him here. Let us look at the fundamental difficulty of the passage. "Saint Paul, in his First Letter to the Corinthians, gives us an idea of the differing impact of God's judgement according to each person's particular circumstances. He does this using images which in some way try to express the invisible, without it being possible for us to conceptualize these images—simply because we can neither see into the world beyond death nor do we have any experience of it. Paul begins by saying that Christian life is built upon a common foundation: Jesus Christ. This foundation endures. If we have stood firm on this foundation and built our life upon it, we know that it cannot be taken away from us even in death." He is speaking of "each person's particular circumstances", but says also that the "each person" and "us" he is referring to are those who live the "Christian life" and whose identity is "built upon a common foundation: Jesus Christ." He then says that death does not deprive us of hope only to the extent that "we have stood firm on this foundation." So, in these passages, Benedict seems to be speaking only of Christians in particular. The language in paragraph 46 moves from "the great majority of people" to those living the "Christian life" without any interruption, leaving us to speculate on the identity of "the great majority of people." If the pope meant to indicate that he was speaking about all humanity, specifying those whose lives are built on "a common foundation: Jesus Christ" is a bizarre way to do so. Martin is correct in stating this passage needs further clarification. If the pope did mean to refer only to Christians, then he is doing nothing than engaging in the age-old speculation of whether or not most Christians would be saved, which is a legitimate topic of discussion. If he was talking about all humanity in general, then the explanation we offered above would be the most appropriate understanding of the pope's words. Fr. Barron's accusation that the clarification of Spe Salvi sought by Ralph Martin is equivalent to the dissent of modernist theologians against Humanae Vitae is unfair. As we have seen above, there is an ambiguity in Spe Salvi 45-46 regarding whether Benedict is referring to the entirety of humanity or simply of the Christian people. Martin seeks a legitimate clarification of what is an admittedly confusing passage, which is completely different from those who challenge the authority of Humanae Vitae. 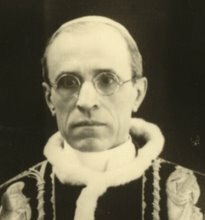 In the case of Martin, he seeks a clearer explanation of the content of Spe Salvi; in the case of Humanae Vitae, the dissenting theologians understand the content plainly but deny its authority, which is entirely different. Fr. Barron ought to know the distinction. To sum up the basics of the last four articles in this series: It is not consonant with Christian tradition to "hope" that Hell is empty. Of course we do not want people to go to Hell, but it is not a matter of what we will. As Benedict says in Spe Salvi, history presents us with too many examples of nefarious evil to realistically cherish this hope. Remember, people have free will, and many choose to reject God; to suggest that we can hope nobody goes to Hell is a denial of the reality of free will - as if men who had definitively rejected God will simply have their wills countermanded by God in opposition to their freedom. This is why Christian Tradition and Magisterial teaching (Syllabus of Errors) have presumed that some people at least are in Hell and hence there is no justification for hoping it is empty. Furthermore, the Christian sensus fidelium attests to this, as Catholic piety throughout the ages not only presumed that real people were actually in Hell, but that fear of Hell was an effective motivation to right living. 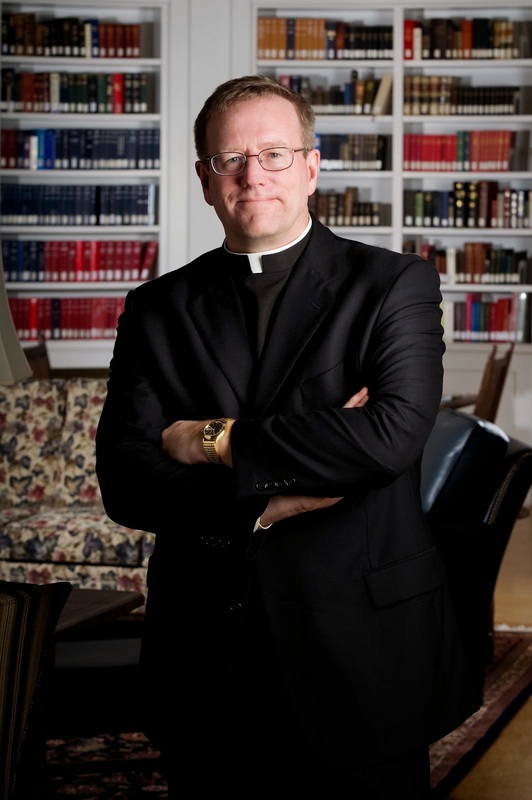 This is how Christians have always understood revelation, and attempts to introduce other interpretations of the data of revelation fundamentally undermine the universal Ordinary Magisterium of the Church, appealing to the tendentious argument that the whole edifice of Christian tradition can be discarded because something has not been formally defined. Attempts to enlist Benedict XVI's encyclical Spe Salvi to prove the Balthasarian theory further run aground due to ambiguities in the text of the document as well as the fact that Spe Salvi 45-46 is not saying what Fr. Barron suggests it says. I hope you have enjoyed the last month of posts on this important topic. Hopefully people will continue to question this problematic theory and reveal Balthasar for the unorthodox theologian he was. Last time, we looked at the concept of a populated Hell as an assumption of the sensus fidelium of the Church throughout history. 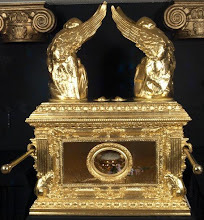 In this post, I propose that the Balthasarian theory that we can have a realistic hope that no human beings wind up in Hell as a denial of the ordinary Magisterium of the Church, or at least a denial of the binding nature of that Magisterium. The ordinary Magisterium of the Church of course consists in the non-extraordinary teachings of the popes and the bishops in union with him and constitutes the ordinary means by which the people of God are taught. But let us not forget that this definition does not represent the fullness of the ordinary Magisterium. 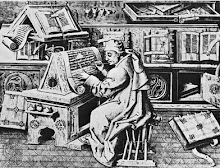 The ordinary Magisterium speaks in the teaching of the popes, but first and foremost it speaks in the simple proclamation of Scripture itself, which part of the ordinary Magisterium since the exposition of the Sacred Scriptures is the heart of theology and the normative means by which the faithful become familiarized with the teachings of our Lord. Now note that the one common thread in the Balthasarian-Barronesque theories of hope for an empty Hell is a simple denial of the plain text of Scripture, which states in multitudes of passages not only that Hell is real, but that real people will wind up there. The Balthasarians will retort that these particular passages have never been infallibly defined to mean that anybody is in Hell, as if the Church hasn't defined a matter, then it is a freely debatable matter of opinion. But this is a denial of the binding nature of the ordinary Magisterium. It would be like saying that whether or not the meek will inherit the earth is an open question, since the Church has not defined that they will. "I mean Jesus said it, but what are we Protestants? We can't just use our private interpretation that "will" means "will" and then go around calling people who deny it heretics." This is, of course, absurd. Jesus said that "the gate is small, and the way is narrow that leads to life, and few are those who find it" (Matt. 7:14). Few (people) find the gate and/or way that leads to life. Period. That's dogma. And whatever "few" means, it cannot mean "all" in this context where it is contrasted again the many that follow the other road. To accept the Balthasarian-Barron thesis means that few must mean all, and we must accept the absurd position that this is somehow debatable because the Church has never formally defined that few means few. The Balthasarian "hope Hell is empty" thesis represents a complete denial of the binding nature of the Church's ordinary Magisterium and leaves us with an approach to biblical exegesis that is in practice no different than Protestantism. Many thanks to my some-time co-blogger Anselm who pointed this argument out to me. We will conclude this series next time with an examination of Benedict XVI's teaching in Spe Salvi which Father Barron quoted in support of his comments. After having voice some initial objections to the "we can have good hope that there is nobody in Hell" theory, today I wanted to go on to look at the question from the point of view of the sensus fidelium of the Christian people, which deals with the Catholic "instinct" rather than with definitions and declarations. 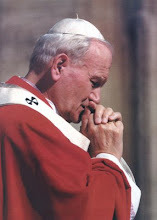 But, speaking of definitions, it could be argued that if the lack of any definitive Church statement that anybody is in Hell constitutes a real argument that it may be empty, then by similar logic, the decrees of canonization and the prayers of the Mass would signify that nobody is in Heaven except our Lord, the Blessed Virgin, and the canonized saints. After all, the Church has never offered "definitions" about anybody else. I am being a bit facetious here. It could always be counter-argued that silence in the scriptures implies salvation, not damnation, but then again, that is begging the question, since that premise ("silence implies salvation") is exactly what is not proven. "The holy people of God shares also in Christ's prophetic office; it spreads abroad a living witness to Him, especially by means of a life of faith and charity and by offering to God a sacrifice of praise, the tribute of lips which give praise to His name. The entire body of the faithful, anointed as they are by the Holy One,cannot err in matters of belief. They manifest this special property by means of the whole peoples' supernatural discernment in matters of faith when "from the Bishops down to the last of the lay faithful" they show universal agreement in matters of faith and morals. That discernment in matters of faith is aroused and sustained by the Spirit of truth. It is exercised under the guidance of the sacred teaching authority..."
As far as I can tell, this is the first statement of the Magisterium where this concept is explicitly affirmed, but the teaching was commonly held and taught by Catholic theologians since at least the mid-19th century. Ludwig Ott mentions it, for example, in Fundamentals of Catholic Dogma. It was often referred to as the passive infallibility of the Ecclesia discens (the learning Church) in contrast to the active infallibility of the Ecclesia docens (the teaching Church). This is the sensus fidelium of Lumen Gentium. It constitutes a kind of "instinct" of the Catholic people. 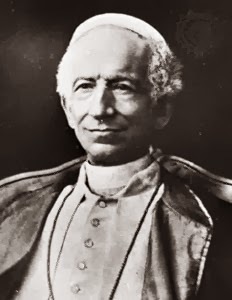 By virtue of the sensus fidelium, the faithful, in obedience to their pastors, are guided in the development of their traditions and intuitions, a kind of holy instinct exercised over a period of history. The notion is much abused now, such to suggest that we could positively establish what Catholic teaching is by means of opinion polls. Benedict XVI commented on this false opinion of the sensus fidelium - see here. 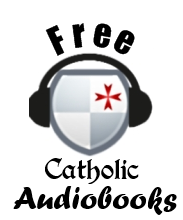 What does the Catholic sensus fidelium say about the idea of Hell throughout the entirety of Church history? There is no fast and easy way to answer this, for when we look at the sensus fidelium, we are not asking what the Church has taught, not looking for lists of definitions from the Councils or citations from Denziger. Instead of asking what the Church teaches, we are asking how the faithful have understood Church teaching. Essentially, we are looking at how culture has appropriated Christian truth. Thus, we are looking at things like artistic depictions of the mysteries of the faith, architectural designs, poetry and literature, popular devotions, and any other popular expressions or interpretations of the faith. Looking at all these expressions of faith collectively, and stretched out over the centuries, we can establish a fairly clear picture of the Church's sensus fidelium on a particular point of faith. If this is the case with monks who were insufficiently careful with the state of their soul, what would be the lot of the sinning or wayward lay person? 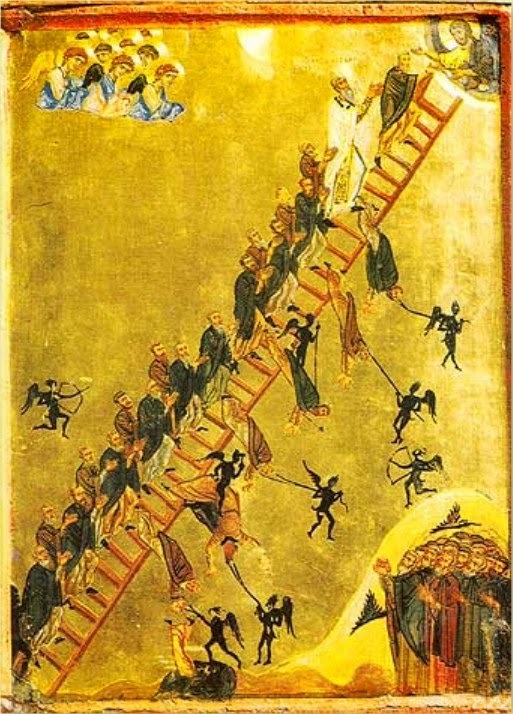 The instruction the viewer is supposed to take away from this image is that the way to salvation is difficult and it is easy to fall away; and, that falling away means being dragged to Hell. In other words, we have here a visual representation of our Lord's words that "Broad is the path that leads to destruction, and there are many who go in by it" (cf. Matt. 7:23). It also demonstrates that by this teaching, the Greeks understood that going to Hell was a very real danger, even for those reputed to be very holy. 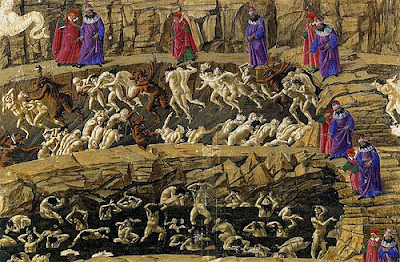 Note the depiction of the torments of the damned in the dark area immediately to the left of the mouth of Hell. Again, the presumption is that Hell will have some human population. In a later manuscript from Cleves around 1400, Hell is depicted as a gaping mouth swallowing up sinners. Note the demons at the lower left wheeling a basket load of damned sinners to dump into the frightening maw of the beast. 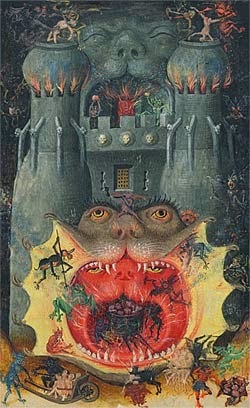 This theme of Hell as a giant mouth grinding sinners was common in later medieval art. It is worth noting that this particular picture was found in a Breviary used by lay persons. That is, this frightening image was meant to be contemplated as one prayer the Divine Office. Clearly, the lesson is meant to be hortatory - this could be you if you aren't careful. 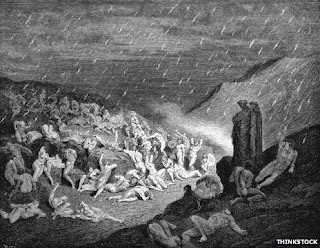 Not only is it inferred that Hell will be populated, but a particular class of sinners is singled out as especially meriting Hell by their unnatural acts. 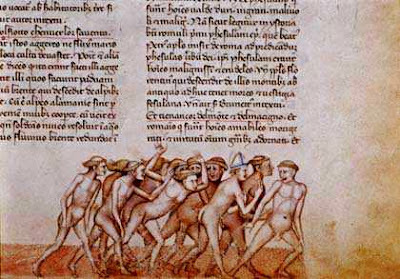 Medieval man clearly understood Hell to be populated by human occupants in addition to the demons. With the 12th and 13th centuries, western Europe saw the rise and expansion of Gothic architecture. Pope Benedict XVI once called the Gothic cathedrals "Bibles in stone" and noted that in their resplendent artistic depictions, theology, art and daily life all come together to "reveal a synthesis of faith and art, harmoniously expressed through the universal and captivating language of beauty" (source). One common feature in most Gothic cathedrals was the portal, the great door through which the faithful entered. 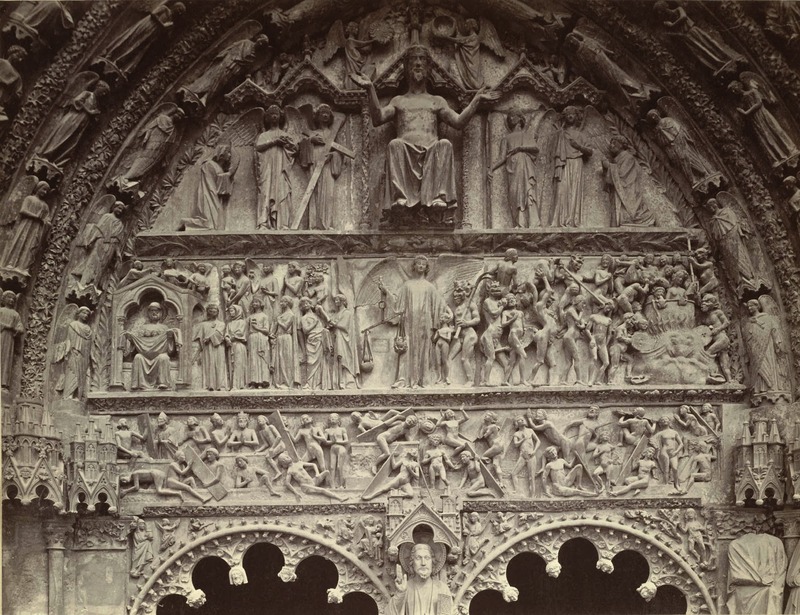 In the high middle ages, it was common for the portals to feature depictions of the Last Judgment, usually above the door on a semi-circular surface called a tympanum. 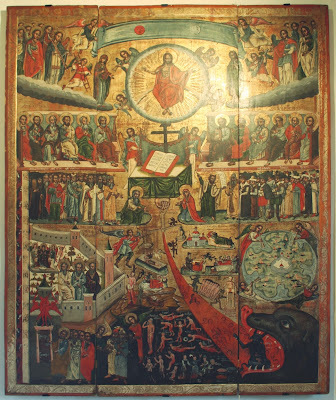 The purpose of depicting the Last Judgment on the portal was to call the faithful to recollect themselves before entering Mass; they were about to approach the altar of the Lord - was their soul sufficiently pure? They were about to enter to worship the eyes of the King and Judge before whom all secrets are laid bare, who would one day judge all men, sending some to heaven, some to damnation. Therefore, before entering Mass, one ought to recollect themselves and examine their conscience. 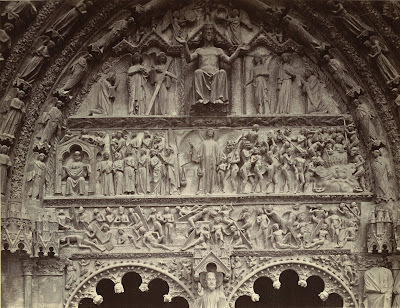 In this first picture, we see the tympanum above the portal of Notre Dame cathedral. At the center we see Christ seated as the Judge. Below on the left (our Lord's right hand), we see the blessed in the charge of an angel about to be led off to eternal life. On the right (our Lord's left), we see the damned in the charge of a demon, who has bound them all with a rope and is about to lead them off to damnation. A similar portal from Bourges Cathedral in central France. Again, at the right hand of Christ we see the righteous, and at Christ's left the damned in the company of the demons being led off to damnation. Both depictions, as well as numerous other Gothic portals, call to mind the parable of the Sheep and the Goats, in which our Lord says to those on His left, "Depart from me, ye accursed, into everlasting fire prepared for the devil and his angels" (cf. Matt. 25:41). 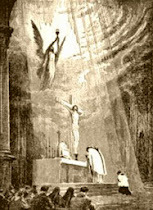 Being that the purpose of the portal was to encourage the worshiper to recollect his mind and examine his conscience prior to Mass, the implication is that the portal images of judgment were meant to lead the worshiper to consider that this fearsome judgment could be his real fate if his life was not sufficiently pure and his conscience not sufficiently clean. In the portals, art meets praxis, leading the observer to contemplate his eternal destiny. Thus, far from being tormented in their conscience about how God could let anybody go to Hell, or about how the presence of sinners in Hell would mean that God and Christ "lost", Dante, and with him the whole medieval tradition, see a profound justice in the fact - not the hypothesis - but the fact of human damnation. We could further cite the 15th century Biblia Pauperum, "The Bible of the Poor", a very unique picture-book of Germanic origin depicting the Bible completely in pictures with very brief Latin captions. 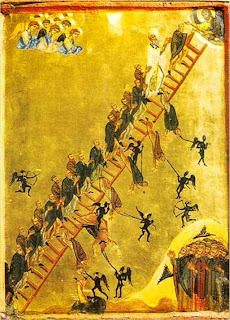 In the Biblia Pauperum's depiction of the Last Judgment, the damned are taken to Hell by a demon who binds them with a cord and drags them off to perdition. Note that, as this book was meant for the illiterate, it's purpose was not scholarly but hortatory. The faithful are supposed to contemplate this reality and amend their lives in light of it, precisely because it is implied that this could happen to them. Medieval piety was nourished by theatrical presentations. Passion Plays depicted the last week of the life of our Lord; Mystery Plays depicted some mystery of the Faith or taught a moral lesson, sometimes using allegory. A very common theme in medieval Mystery Plays was the Day of Judgment, in which the just were depicted being carried away to Heaven, while the damned were dragged away to Hell by actors dressed as demons, usually to a hidden chamber under the stage or make-shift monster head representing the gates of Hell. These plays were meant to inspire morality in the people, and fear of a real possibility of damnation was a clear part of this message. Again, the warning, 'This could be you.' These plays continued right up into the early modern period and occasionally still take place in certain areas of Europe. During the Renaissance, multiple works were composed which depicted the pains of Hell, many of them at the behest of clerics or even popes. The most famous, of course, being Michelangelo's Sistine Chapel illustration of the Last Judgment, which Cardinals are meant to contemplate as they select the successor to Peter. Above is a close up of the damned being ferried into Hell by the classical figure of Charon. Can we imagine anything more offensive than to suggest that a depiction of the damned be carried to Hell on the wall of the Sistine Chapel is not an extremely powerful argument that the Church does in fact assume that there are people in Hell? Especially given that this image was requested by the pope himself? The sensus fidelium of the Christian people, from the earliest days of Christianity on up, was clearly that not only was Hell a real place, but that there was a real danger that one could wind up there; not only this, but that it was in fact easy to wind up there, and that this was a particular danger to those who were careless about their salvation. In all this it was simply presumed that Hell had a human population, that real folks ended up in Hell. And if people believed this, it was no surprise. It is easily deduced from the Bible. Hagiographies, such as the Golden Legend of Jacob de Voraigne were replete with stories of people going to Hell, souls in Hell appearing in visions to warn people against making the same bad choices, visions of the torments of Hell, etc. And if you can endure so little pain now, how will you stand everlasting torments? If you lose your patience over a small suffering now, what will the fires of hell do hereafter? You cannot have two heavens: it is impossible to enjoy yourself here and afterward to reign with Christ." (Thomas a Kempis, Imitation of Christ, Book 1, Chapter 24). Such passages are legion in devotional books of the late medieval and early modern periods. The hortatory value of such passages consists precisely in that the reader is invited to contemplate the pains of Hell as a very real possibility for their own soul. The knowledge that one's own soul can actually wind up in a state of eternal torment provides the impetus to do penance and cling to Christ. Note that the moral force of such arguments is drained considerably if the possibility of a soul winding up in Hell is not a real one. Theological studies and popular sermons alike took for granted that people went to Hell. Both St. Thomas' Summa and his Compendium of Theology contain numerous passages on Hell, why its punishments are eternal, how the souls there suffer pain, of what nature is the "fire" that torments damned souls. St. Alphonsus Ligouri has many famous sermons on the pains of the damned and the nature of the punishments of Hell, as do many other saints, all of which were meant to be understood by the people as exhortations to avoid what was a real possibility - eternal damnation - and it was assumed that many others had already not managed to avoid it. We must note an important distinction here: Christian sensus fidelium does not simply say it is really possible for someone to wind up in Hell; Balthasarians admit this as well. The sensus fidelium presumes that there are in fact already people in Hell, and that it is inevitable that people will wind up in Hell. In other words, Christians tradition views it as an impossibility that Hell is empty. The truth is bound up with teaching, and teaching with learning. The Balthasarian can always retort that none of the evidence we have brought forward here are 'official Church teaching'. True. But there is more than the Church teaching; there is the Ecclesia discens, the Church learning, which reveals to us how the Catholic people, animated by the Holy Spirit and led by God, have understood and amalgamated the truths that the Church has taught them. In this case, the sensus fidelium of the Catholic people on the real presence of human beings in Hell is so weighty and universal as to render any arguments to the contrary entirely impotent. The sensus fidelium is bound up with the development of doctrine and Christian Tradition. If the Balthasarian-Fr. Barron theorem is true, then all of these centuries of artistic, architectural and literary development, in fact the whole instinct of the Christian people, is without purpose. Our traditions are meaningless, and we might as well not even speak of a sensus fidelium or en ecclesia discens at all, because clearly the common understanding of the Christian people will have given way to the novelties of "experts." To sum it up, Balthasar and Fr. Barron say it is "possible" that Hell is empty. The sensus fidelium presumes it is inevitable that Hell will not be empty; it is impossible for Hell to be empty. Balthasar says it is possible; the Catholic instinct says it is impossible. Next time, we will examine the Fr. Barron-Balthasar empty hell theory as a denial of the ordinary Magisterium of the Church. Michael Voris recently came out with a video entitled simply "Fr. 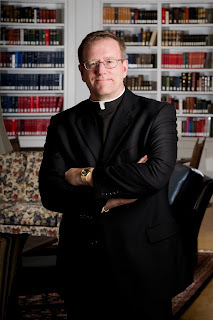 Barron is Wrong", challenging the popular priest-evangelist on his repeated statements in favor of the theory proposed by the late Hans Urs von Balthasar in Dare We Hope? that it is acceptable for Christian to have good hope that Hell may be empty. 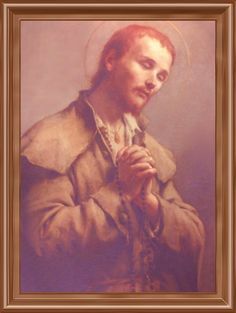 Voris rightly notes that Christ Himself says some souls will definitely go to Hell on numerous occasions, and that the Church's alleged "silence" on the definitive presence of anyone in Hell is not due to any support for the empty-hell theory, but due to the fact that the definitive presence of any one soul in Hell is not part of Divine Revelation and therefore outside the pale of the Church's competence to define. Therefore, the fact that the Church has never "proclaimed" anyone in Hell provides no rationale whatsoever for asserting that Hell is empty. At this point Mark Shea jumped in and accused Voris of smearing Fr. Barron wrongly with his "poison." It is not my intention here to comment on the antagonism between Voris and Shea; I am more interested in Shea's comments that the Fr. Barron-Balthasar "Empty Hell" theory is "perfectly within the pale of orthodox speculation" and that "at the end of the day, that’s all you have: two schools of opinion–both of which are allowed by the Church." Thus, the Balthasarian "Empty Hell" theory is granted a legitimate place on the spectrum of legitimate opinions upon which Catholics can disagree in good conscience, and the traditional opinion that people do in fact go to Hell is also placed on the spectrum as another legitimate "option." This defense of Fr. Barron and Balthasar apparently goes back to Shea's position that Tradition itself has two "irreconcilable" aspects of the question of Hell that leave the issue fraught with a certain "tension", which I contest but will leave off for the time being. "Good hope at least is to be entertained of the eternal salvation of all those who are not at all in the true Church of Christ." 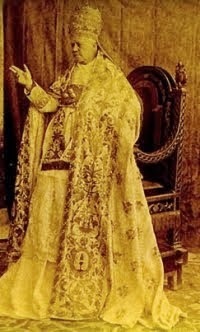 -- Encyclical "Quanto conficiamur," Aug. 10, 1863, etc. This is precisely what Fr. Barron and Balthasar assert, and what Mark Shea says is "perfectly within the pale of orthodox speculation." Fr. Barron says we can at least have a good hope that everyone makes it to heaven, and yet Pius IX specifically condemns this opinion. Not only proclaiming knowledge of universal salvation, but even allowing "good hope" to so much as be "entertained" is condemned. Period. Our Lord teaches as much when He says, "Enter ye in at the narrow gate: for wide is the gate, and broad is the way that leadeth to destruction, and many there are who go in through it." (Matt. 7:13). He does not suggest that there are many for whom it is possible that they go to destruction but do not actually go; He says "many there are who go through it." Many means many. Many does not mean "nobody." In discussions about this topic by apologists pushing the Balthasarian opinion, I seldom see any reference to Luke 13, when Jesus is asked the question point blank, "Lord, are only few people going to be saved?" to which Christ responds, "Strive to enter by the narrow gate; for many, I say to you, shall seek to enter, and shall not be able." (v.23-24). You see that? Many shall seek to enter, and shall not be able. This is not the realm of the hypothetical. Revelation 20:15 is cited by Voris in his video, which says, "And whosoever was not found written in the book of life, was cast into the pool of fire." Again, this is not presented as a hypothetical, but as a real vision of the situation at the Last Judgment. It could be countered that it only says that people not in the book of life get cast into the pool of fire, but does not imply that anyone was actually in this unfortunate position. We do know at least, however, that two individuals will be damned: the Beast and the False Prophet: "And the devil, who deceived them, was thrown into the lake of burning sulfur, where the beast and the false prophet had been thrown. They will be tormented day and night for ever and ever." (Rev. 20:10). Furthermore, if nobody was actually thrown into the pool of fire, how would John have this knowledge that anyone whose name was not in the book would be thrown in the pool of fire? To put it another way: Suppose I say, "I was uptown yesterday, and I saw the police were ticketing everybody who weren't wearing seat belts." Then suppose you ask, "So how many people got ticketed?" and I say, "Oh, nobody" wouldn't you be utterly confused? The basic grammar of the statement "I saw the police were ticketing everybody who weren't wearing seat belts" implies an action completed in the past, not some hypothetical. This demonstrates the kind of contortions one has to put the Scriptures through to deny the obvious fact that some people will wind up eternally damned. We could also cite Lumen Gentium 16, which says, "Some there are who, living and dying in this world without God, are exposed to final despair. Wherefore to promote the glory of God and procure the salvation of all of these, and mindful of the command of the Lord, "Preach the Gospel to every creature", the Church fosters the missions with care and attention." Note that LG 16 says that "there are" some who wind up dying in final despair without God, and then goes on to cite this as one of the reasons for the urgency of the Great Commission, which is in accord with Tradition: the Gospel must be preached in order to save souls from Hell. Fr. Barron and Shea both assert that the Empty Hell theory of Balthasar seems to be taught by Pope Benedict XVI in Spe Salvi. Having just completed a very thorough study of the late pontiff's encyclical, I dispute this fact, but that is for another post. But it is sufficient to say that, if we are reading the Magisterium in continuity with itself, Spe Salvi can simply not mean what Fr. Barron and Shea suggest, otherwise Benedict XVI contradicts Pius IX. The "Empty Hell" theory is not one of many legitimate "schools of thought." It is a novelty, toyed with early on by Origen and then virtually abandoned until the modern era. The amount of legerdemain and re interpretive manipulation one has to do to Scripture, Magisterial teaching, history and tradition in order to breathe life into the theories of Fr. Barron and Balthasar on this question is appalling. The evidence in favor of the traditional teaching that there are people in Hell outweighs Balthasar and Fr. Barron's positions as a tidal wave overwhelms a sand castle. That this novelty is being defended by some as a legitimate position within the pale of orthodoxy is sad, especially in light of Syllabus of Errors number 17 which explicitly condemns it. It should also be noted, in case one wants to write off Voris, that very respected mainstream priests and theologians also consider Fr. Barron's opinions very troubling, such as Msgr. Charles Pope of the Archdiocese of Washington (see here) as well as Dr. Scott Hahn, who once stated that Balthasar's theory was absolutely without merit. I'm not anti-Mark Shea. His book, By What Authority? helped bring me to the Church. But, as Voris said of Fr. Barron, Mark Shea is simply wrong here. I'm not "attacking" him, not "smearing" him, not calling him a heretic. I am just saying he is simply wrong. Being that we are entering that period of the liturgical year when the readings direct our minds towards the Last Things, for the remainder of November all my posts will relate to this question of Hell, its reality, eternal duration, and the Church's Tradition on this important subject. Next time, I will examine the definitive presence of damned souls in Hell throughout Christian Tradition as established by the Christian sensus fidelium.